New Way manufactures custom slides utilizing Porous Media™ air bearing technology to provide precision solutions for fast tool servo applications. You’ll find more specific information about custom slides for fast tool servo applications below. If you are diamond turning and machining free-form surface structures such as micro-prisms, torics, and off-axis aspheres for spheric and aspheric lens array formations you have a requirement for high dynamic movement of your machine tool with low levels of noise. The use of non-contact, high stiffness air bearing guideways as your tool platform enables you to create such part topographies. Using New Way fast tool servo stages gives you a significant advantage in both accuracy and move time, allowing a diamond tool to correspond to the spinning toroidal surface accurately and quickly, raising device yields and throughput to new levels. Conventional mechanical bearing systems are fraught with friction, as they use rolling element bearings or contact type ways, leading to inevitable trade-offs between accuracy and move time. New Way fast tool servos utilize Porous Media technology inside the air bearings mounted within each slide. When you apply a small amount of air pressure (60PSI or 0.4 MPA) to these bearings, a thin (5µm or 0.0002″) layer of air is distributed evenly across the bearing face through millions of sub-micron sized holes. This air film layer is incredibly stiff, enabling non-contact linear motion of the slide along the guide. 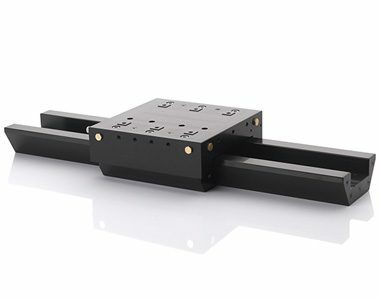 This enables precise motion in one axis, and allows the high accelerations and short movements necessary to achieve tool motion frequencies of up to 1000 Hz. Because these air bearing slides have zero friction, they also enable rapid exponential levels of decay for following errors to within nanometers of the desired target position. Using smaller positioners such as non-contact brushless linear motors and voice coil actuators, the friction, backlash, and wear present in screw driven stages is eliminated entirely. This creates a platform where nanometer level resolution is possible and the machined surfaces often require little to no polishing, down to a 3nm Ra surface finish, depending on the material used and the manufacturer’s process.